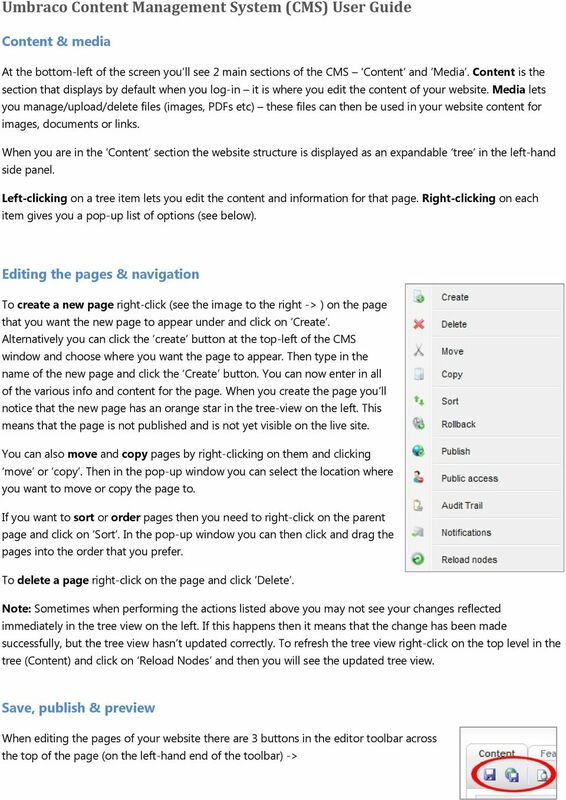 Download "Umbraco Content Management System (CMS) User Guide"
2 Save only saves your changes but doesn t make them live. This is useful if you ve made some content changes but you re not sure whether you want them to go live straight away, or if you are interrupted while making some content changes. Save & Publish saves your changes and makes them live straight away. Preview lets you preview your saved changes before you publish them so that you can see how they will look in the website layout. Content Editing When editing content it is important to use consistent styles for the various headings and text this follows good web/information design principles. 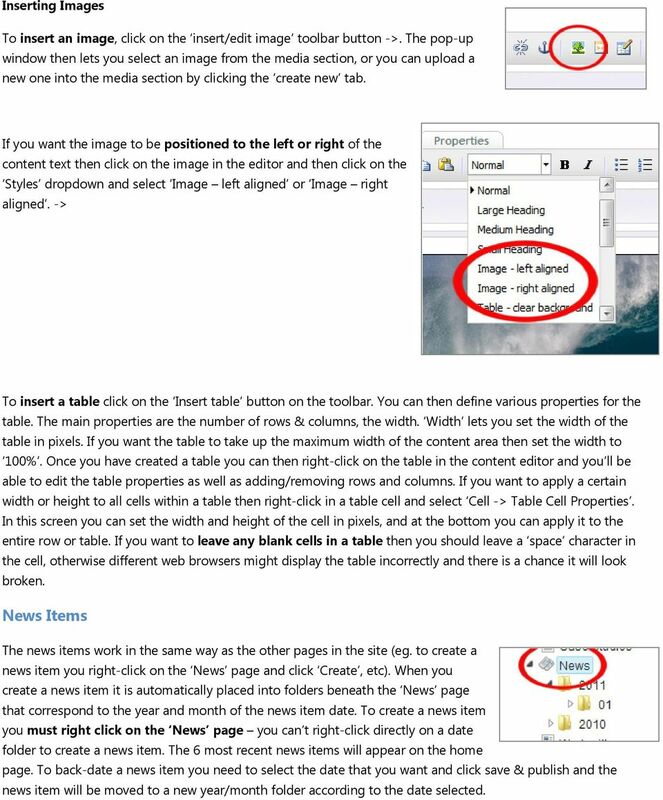 When editing a page, across the top of the CMS you ll see a content editor toolbar. There is a drop-down select box titled styles. This list of styles allows you to apply formatting to pieces of text for various headings and text sizes. You need to highlight the piece of text by clicking and dragging the mouse and selecting the piece of text, and then you need to select a style to apply to the text. Copying & pasting text from Word or another web page Be careful when cutting and pasting content from Word or other web pages as this can cause strange & inconsistent formatting to be applied to the text. In this situation use the paste from word button on the toolbar (next to the styles drop down list). If there is still some strange formatting then you can highlight the text and click the remove formatting button in the toolbar (the eraser icon). If the formatting still persists then delete the text, and then open Notepad on your computer and paste the text into Notepad (this converts the text into plain-text). 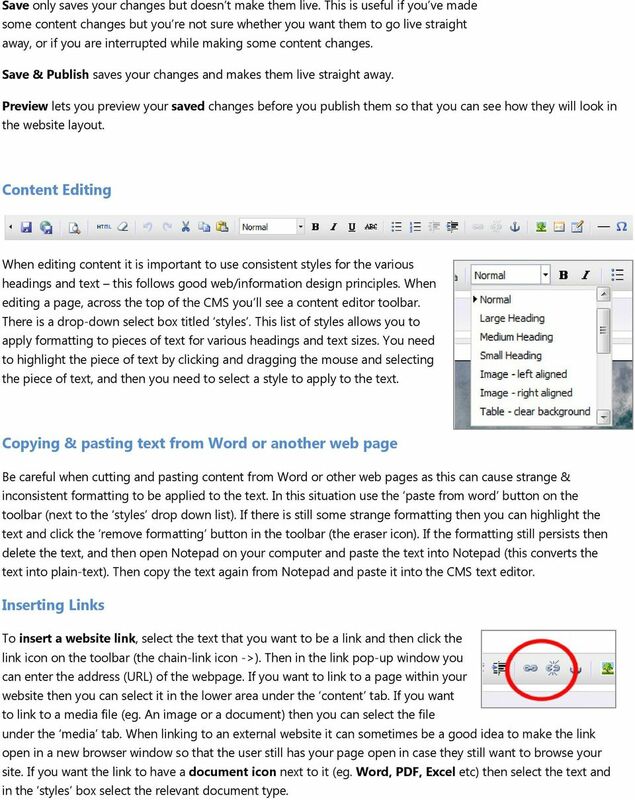 Then copy the text again from Notepad and paste it into the CMS text editor. Inserting Links To insert a website link, select the text that you want to be a link and then click the link icon on the toolbar (the chain-link icon ->). Then in the link pop-up window you can enter the address (URL) of the webpage. If you want to link to a page within your website then you can select it in the lower area under the content tab. If you want to link to a media file (eg. An image or a document) then you can select the file under the media tab. When linking to an external website it can sometimes be a good idea to make the link open in a new browser window so that the user still has your page open in case they still want to browse your site. If you want the link to have a document icon next to it (eg. Word, PDF, Excel etc) then select the text and in the styles box select the relevant document type. 3 Inserting Images To insert an image, click on the insert/edit image toolbar button ->. The pop-up window then lets you select an image from the media section, or you can upload a new one into the media section by clicking the create new tab. If you want the image to be positioned to the left or right of the content text then click on the image in the editor and then click on the Styles dropdown and select Image left aligned or Image right aligned. -> To insert a table click on the Insert table button on the toolbar. You can then define various properties for the table. The main properties are the number of rows & columns, the width. Width lets you set the width of the table in pixels. If you want the table to take up the maximum width of the content area then set the width to 100%. Once you have created a table you can then right-click on the table in the content editor and you ll be able to edit the table properties as well as adding/removing rows and columns. If you want to apply a certain width or height to all cells within a table then right-click in a table cell and select Cell -> Table Cell Properties. In this screen you can set the width and height of the cell in pixels, and at the bottom you can apply it to the entire row or table. If you want to leave any blank cells in a table then you should leave a space character in the cell, otherwise different web browsers might display the table incorrectly and there is a chance it will look broken. News Items The news items work in the same way as the other pages in the site (eg. to create a news item you right-click on the News page and click Create, etc). When you create a news item it is automatically placed into folders beneath the News page that correspond to the year and month of the news item date. To create a news item you must right click on the News page you can t right-click directly on a date folder to create a news item. The 6 most recent news items will appear on the home page. To back-date a news item you need to select the date that you want and click save & publish and the news item will be moved to a new year/month folder according to the date selected. 4 Events The events work in the same way as the news items with the year/month folders. To add an event you right-click on the upcoming events page and click create. Once an event date has passed then the event will appear in the event archive page. Galleries The galleries work in the same way as the news items with the year/month folders. To add a gallery you rightclick on the galleries page and click create. You can then enter a title for the gallery, and also a date, image, link and description. For Sale The sale items are added by right clicking on the for sale page and clicking create. You can then enter the information for the item. Suppliers Suppliers are very similar to the for sale items above right click on suppliers page to add a new supplier. Media Images & Files The media section is where you upload and manage the images and files that you want to use in your website. It is accessed by clicking on Media in the menu at the bottom left of the CMS. Folders are used for keeping your images and files organised, which can be helpful if you have lots of media items. There are 3 types of media images, files and folders. Files are used for everything that isn t an image, eg. PDF, Word, Excel, Powerpoint etc. Uploading Images To upload an image or file you need to click on the folder where you want to create the item and then click on the upload tab across the top. Then click the upload files button and select the files/images that you want to upload. Once the upload is finished, the tree on the left sometimes doesn t update. To refresh the tree, rightclick on the folder and click reload nodes. 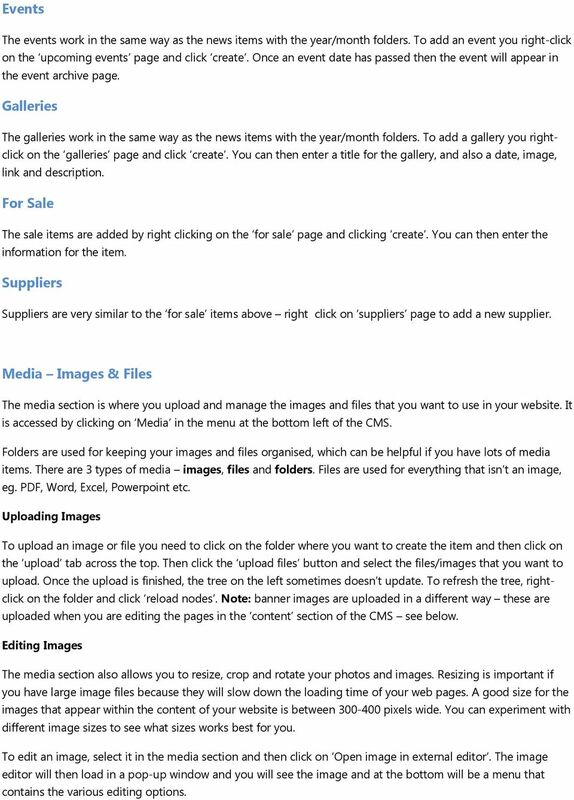 Note: banner images are uploaded in a different way these are uploaded when you are editing the pages in the content section of the CMS see below. Editing Images The media section also allows you to resize, crop and rotate your photos and images. Resizing is important if you have large image files because they will slow down the loading time of your web pages. A good size for the images that appear within the content of your website is between pixels wide. You can experiment with different image sizes to see what sizes works best for you. To edit an image, select it in the media section and then click on Open image in external editor. The image editor will then load in a pop-up window and you will see the image and at the bottom will be a menu that contains the various editing options. University of East Anglia Liferay Training Admissions, Recruitment and Marketing Department i Version 3.4 Contents Overview...iii Introducing Liferay... iv 1. Logging in and accessing your site... 1 2. A quick guide to... Creating Newsletters In this guide... Learn how to create attractive, well-designed HTML and plain-text messages to engage your contacts, meet their expectations and match their preferences. Have you seen the new TAMUG websites? If you have any questions or problems along the way, please don't hesitate to call, e-mail, or drop in to see us. We'd be happy to help you. Editing images for photo-only banners* Open Photoshop Determine if photo is wide enough On the top menu, select Image > Image Size Photo must be at least 720 px wide to crop without blowing up the photo. This short guide will teach you how to turn your newly installed Joomla 2.5 site into a basic three page website.